Plum Market, a food and beverage company based in Farmington Hills, will open a street concept store inside Bedrock’s Ally Detroit Center at 500 Woodward Ave. in summer 2019, the companies announced today. The location will offer fast casual dining options, grab-and-go items, select groceries, and a full-service bar with an emphasis on locally sourced products. 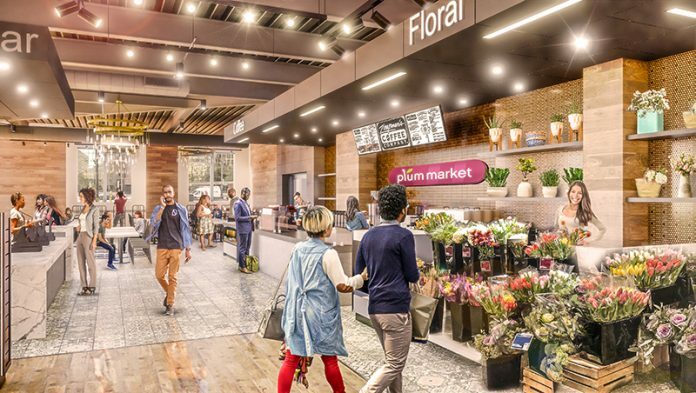 Plum Market will open a similar concept at the Pistons Performance Center in Detroit’s New Center in spring 2019. New locations also were recently opened at Oakland University and Northwestern University. The location will feature an on-site kitchen serving breakfast, lunch, and dinner. Grab-and-go options will include self-service hot foods, salads, soups, and sandwiches. The bar will offer wine, local beer, and craft cocktails, as well as a coffee bar brewing Zingerman’s coffee. Packaged snacks and fresh-cut flowers also will be available for sale, as well as Zingerman’s baked goods and specialty candies. The Spirit Room, a rentable event space with outdoor seating overlooking the Spirit of Detroit also will be available. Plum Market focuses on all-natural, organic, and local products at locations across southeast Michigan and Chicago. It also offers gluten-free, vegetarian, dairy-free, and vegan options. The Detroit location will feature mosaics and natural finishes. Plum Market has partnered with Forgotten Harvest for local food redistribution in southeast Michigan. The two organizations will open two new Forgotten Harvest locations in downtown Detroit. Current Plum Market locations include five full-service grocery stores and 10 quick-service smaller format locations.